History Of Jewish Temples On The Temple Mount: Beginning In 957 B.C. The Hebrew name given in the Hebrew Bible for the building complex is either Beit YHWH (House of Yahweh, or Jehovah), Beit HaElohim “House of God”, or simply Beiti “my house”, Beitekhah “your house” etc. The term hekhal “hall” or main building is often translated “temple” in older English Bibles. In rabbinical literature the temple is Beit HaMikdash, “The Sanctified House”, and only the Temple in Jerusalem is referred to by this name. The Hebrew Bible says that the First Temple was built in 957 BCE by King Solomon. According to the Book of Deuteronomy, as the sole place of Israelite sacrifice (Deuteronomy 12:2-27), the Temple replaced the Tabernacle constructed in the Sinai Desert under the auspices of Moses, as well as local sanctuaries, and altars in the hills. This temple was sacked a few decades later by Shoshenq I, Pharaoh of Egypt. Although efforts were made at partial reconstruction, it was only in 835 BCE when Jehoash, King of Judah in the second year of his reign invested considerable sums in reconstruction, only to have it stripped again for Sennacherib, King of Assyria c. 700 BCE. The First Temple was totally destroyed by the Babylonians in 586 BCE (425 BCE according to historical Jewish sources) when they sacked the city. According to the Book of Ezra, construction of the Second Temple was authorized by Cyrus the Great and began in 538 BCE, after the fall of the Babylonian Empire the year before. It was completed 23 years later, on the third day of Adar, in the sixth year of the reign of Darius the Great (12 March 515 BCE), dedicated by the Jewish governor Zerubbabel. However, with a full reading of the Book of Ezra and the Book of Nehemiah, there were four edicts to build the Second Temple, which were issued by three kings. Cyrus in 536 BCE, which is recorded in the first chapter of Ezra. Next, Darius I of Persia in 519 BCE, which is recorded in the sixth chapter of Ezra. Third, Artaxerxes I of Persia in 457 BCE, which was the seventh year of his reign, and is recorded in the seventh chapter of Ezra. Finally, by Artaxerxes again in 444 BCE in the second chapter of Nehemiah. Also, despite the fact that the new temple was not as extravagant or imposing as its predecessor, it still dominated the Jerusalem skyline and remained an important structure throughout the time of Persian suzerainty. Moreover, the temple narrowly avoided being destroyed again in 332 BCE when the Jews refused to acknowledge the deification of Alexander the Great of Macedonia. Alexander was allegedly “turned from his anger” at the last minute by astute diplomacy and flattery. Further, after the death of Alexander on 13 June 323 BCE, and the dismembering of his empire, the Ptolemies came to rule over Judea and the Temple. Under the Ptolemies, the Jews were given many civil liberties and lived content under their rule. However, when the Ptolemaic army was defeated at Panium by Antiochus III of the Seleucids in 198 BCE, this policy changed. Antiochus wanted to Hellenize the Jews, attempting to introduce the Greek pantheon into the temple. Moreover, a rebellion ensued and was brutally crushed, but no further action by Antiochus was taken, and when Antiochus died in 187 BCE at Luristan, his son Seleucus IV Philopator succeeded him. However, his policies never took effect in Judea, since he was assassinated the year after his ascension. Antiochus IV Epiphanes succeeded his older brother to the Seleucid throne and immediately adopted his father’s previous policy of universal Hellenisation. The Jews rebelled again and Antiochus, in a rage, retaliated in force. Considering the previous episodes of discontent, the Jews became incensed when the religious observances of Sabbath and circumcision were officially outlawed. When Antiochus erected a statue of Zeus in their temple and Hellenic priests began sacrificing pigs (the usual sacrifice offered to the Greek gods in the Hellenic religion), their anger began to spiral. When a Greek official ordered a Jewish priest to perform a Hellenic sacrifice, the priest (Mattathias) killed him. In 167 BCE, the Jews rose up en masse behind Mattathias and his five sons to fight and win their freedom from Seleucid authority. Mattathias’ son Judas Maccabaeus, now called “The Hammer”, re-dedicated the temple in 165 BCE and the Jews celebrate this event to this day as a major part of the festival of Hanukkah. The temple was rededicated under Judas Maccabaeus in 164 BCE. During the Roman era, Pompey entered (and thereby desecrated) the Holy of Holies in 63 BCE, but left the Temple intact. In 54 BCE, Crassus looted the Temple treasury, only for him to die the year after at the Battle of Carrhae against Parthia. According to folklore, he was executed by having molten gold poured down his throat. When news of this reached the Jews, they revolted again, only to be put down in 43 BCE. Around 20 BCE, the building was renovated and expanded by Herod the Great and became known as Herod’s Temple. It was destroyed by the Romans in 70 CE during the Siege of Jerusalem. During the Bar Kokhba revolt against the Romans in 132–135 CE, Simon bar Kokhba and Rabbi Akiva wanted to rebuild the Temple, but bar Kokhba’s revolt failed and the Jews were banned from Jerusalem (except for Tisha B’Av) by the Roman Empire. Emperor Julian allowed to have the Temple rebuilt but the Galilee earthquake of 363 ended all attempts ever since. After the Muslim conquest of Jerusalem in the 7th century, Umayyad Caliph Abd al-Malik ibn Marwan ordered the construction of an Islamic shrine, the Dome of the Rock, on the site of the Temple. The shrine has stood on the mount since 691 CE; the al-Aqsa Mosque, from roughly the same period, also stands in the Temple courtyard. The Temple Mount, along with the entire Old City of Jerusalem, was captured from Jordan by Israel in 1967 during the Six-Day War, allowing Jews once again to pray at the holy site. [clarification needed]Jordan had occupied East Jerusalem and the Temple Mount immediately following Israel’s declaration of independence on May 14, 1948. Israel officially unified East Jerusalem, including the Temple Mount, with the rest of Jerusalem in 1980 under the Jerusalem Law, though United Nations Security Council Resolution 478 declared the Jerusalem Law to be in violation of international law. The Muslim Waqf, based in Jordan, has administrative control of the Temple Mount. There are four theories as to where the Temple stood; where the Dome of the Rock is now located, to the north of the Dome of the Rock (Professor Asher Kaufman), to the east of the Dome of the Rock (Professor Joseph Patrich of the Hebrew University). and to the south of the Temple Mount on Mount Ophel. the smaller “inner sanctum”, known as the Holy of Holies or Kodesh HaKodashim. According to the Talmud, the Women’s Court was to the east and the main area of the Temple to the west. The main area contained the butchering area for the sacrifices and the Outer Altar on which portions of most offerings were burned. An edifice contained the ulam (antechamber), the hekhal (the “sanctuary”), and the Holy of Holies. The sanctuary and the Holy of Holies were separated by a wall in the First Temple and by two curtains in the Second Temple. The sanctuary contained the seven branched candlestick, the table of showbread and the Incense Altar. On the east side was Shaar Nikanor, between the Women’s Courtyard and the main Temple Courtyard, which had two minor doorways, one on its right and one on its left. On the western wall, which was relatively unimportant, there were two gates that did not have any name. The Temple was the place where offerings described in the course of the Hebrew Bible were carried out, including daily morning and afternoon offerings and special offerings on Sabbath and Jewish holidays. Levites recited Psalms at appropriate moments during the offerings, including the Psalm of the Day, special psalms for the new month, and other occasions, the Hallel during major Jewish holidays, and psalms for special sacrifices such as the “Psalm for the Thanksgiving Offering” (Psalm 100). The superintendent said to them, bless one benediction! and they blessed, and read the Ten Commandments, and the Shema, “And it shall come to pass if you will hearken”, and “And [God] spoke…”. They pronounced three benedictions with the people present: “True and firm”, and the “Avodah” “Accept, Lord our God, the service of your people Israel, and the fire-offerings of Israel and their prayer receive with favor. Blessed is He who receives the service of His people Israel with favor” (similar to what is today the 17th blessing of the Amidah), and the Priestly Blessing, and on the Sabbath they recited one blessing; “May He who causes His name to dwell in this House, cause to dwell among you love and brotherliness, peace and friendship” on behalf of the weekly Priestly Guard that departed. Part of the traditional Jewish morning service, the part surrounding the Shema prayer, is essentially unchanged from the daily worship service performed in the Temple. In addition, the Amidah prayer traditionally replaces the Temple’s daily Tamid and special-occasion Mussaf (additional) offerings (there are separate versions for the different types of sacrifices). They are recited during the times their corresponding offerings were performed in the Temple. A traditional personal plea for the restoration of the Temple at the end of the private recitation of the Amidah. A prayer for the restoration of the “house of our lives” and the shekhinah (divine presence) “to dwell among us” is recited during the Amidah prayer. The destruction of the Temple is mourned on the Jewish fast day of Tisha B’Av. Three other minor fasts (Tenth of Tevet, 17th of Tammuz, and Third of Tishrei), also mourn events leading to or following the destruction of the Temple. There are also mourning practices which are observed at all times, for example, the requirement to leave part of the house unplastered. “Hebrew” redirects here. For other uses, see Hebrew (disambiguation). This article contains IPA phonetic symbols. Without proper rendering support, you may see question marks, boxes, or other symbols instead of Unicode characters. For an introductory guide on IPA symbols, see Help: IPA. This article contains Hebrew text.Without proper rendering support, you may see question marks, boxes, or other symbols instead of Hebrew letters. Hebrew (/ˈhiːbruː/; עִבְרִית‎, Ivrit [ʔivˈʁit] ( listen) or [ʕivˈɾit] ( listen)) is a Northwest Semitic language native to Israel, spoken by over 9 million people worldwide.Historically, it is regarded as the language of the Israelites and their ancestors, although the language was not referred to by the name Hebrew in the Tanakh. 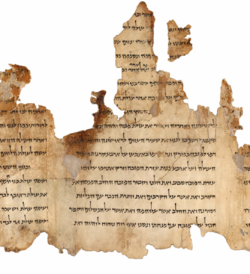 [note 2]The earliest examples of written Paleo-Hebrew date from the 10th century BCE. Hebrew belongs to the West Semitic branch of the Afroasiatic language family. Hebrew is the only living Canaanite language left, and the only truly successful example of a revived dead language. Hebrew had ceased to be an everyday spoken language somewhere between 200 and 400 CE, declining since the aftermath of the Bar Kokhba revolt. [note 3]Aramaic and to a lesser extent, Greek was already in use as international languages, especially among elites and immigrants. It survived into the medieval period as the language of Jewish liturgy, rabbinic literature, intra-Jewish commerce, and poetry. Then, in the 19th century, it was revived as a spoken and literary language. It became the lingua franca of Palestine’s Jews, and subsequently of the State of Israel. According to Ethnologue, in 1998, it was the language of 5 million people worldwide. After Israel, the United States has the second largest Hebrew-speaking population, with 220,000 fluent speakers, mostly from Israel. Modern Hebrew is one of the two official languages of the State of Israel (the other being Modern Standard Arabic), while pre-modern Hebrew is used for prayer or study in Jewish communities around the world today. Ancient Hebrew is also the liturgical tongue of the Samaritans, while modern Hebrew or Arabic is their vernacular. As a foreign language, it is studied mostly by Jews and students of Judaism and Israel, and by archaeologists and linguists specializing in the Middle East and its civilizations, as well as by theologians in Christian seminaries. The Torah (the first five books), and most of the rest of the Hebrew Bible is written in Biblical Hebrew, with much of its present form specifically in the dialect that scholars believe flourished around the 6th century BCE, around the time of the Babylonian captivity. For this reason, Hebrew has been referred to by Jews as Leshon Hakodesh (לשון הקדש‎), “the Holy Language”, since ancient times. Note: Ancient Sumerian translations were taken from William Bramley’s book, The Gods of Eden.